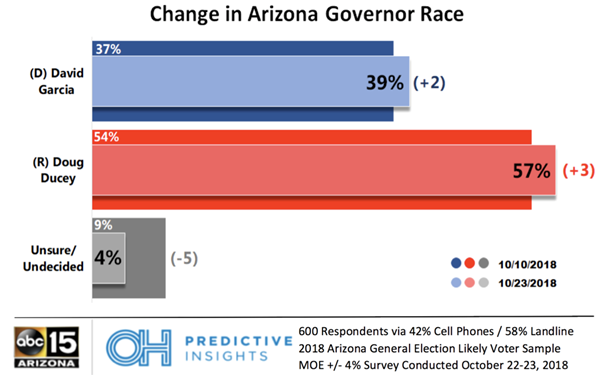 OHPI/ABC 15 has released its latest polling data on Arizona statewide races and it appears that Republicans are leading. 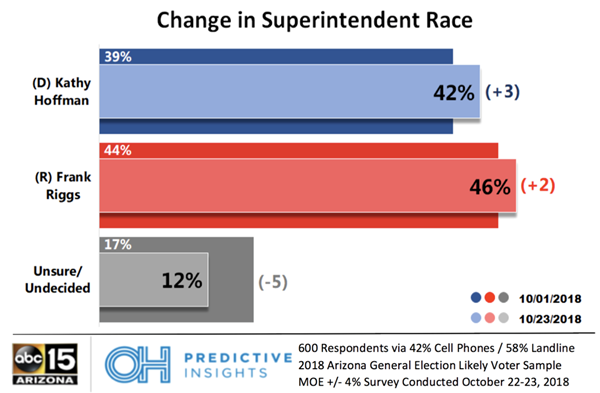 The one race that is closest is the Arizona Superintendent of Public Instruction race where Frank Riggs is slightly ahead of Kathy Hoffman. Steve Gaynor leads Secretary of State race. his way. 16% of them remain undecided, the largest of any ideological group. 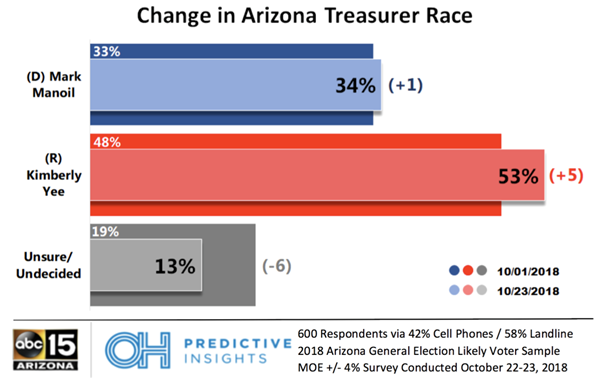 Kimberly Yee leads Arizona Treasurer race. With undecided voters beginning to make up their minds, it seems they are leaning towards Yee. She has gained 5 points to Mark Manoil’s 1 point, since our last poll. Mark Brnovich leads Attorney General race. January Contreras has gained a large amount of male support, with an 8-point increase since our last poll. Even with this loss, Brnovich still holds a 14-point lead. Frank Riggs narrowly leads Superintendent of Public Instruction race. This is the closest race, with Riggs holding a 4-point lead and 12% of voters still undecided. Among those who believe education is a top priority, Hoffman leads by 60 points. Doug Ducey leads Arizona Governor race. Since our last poll, Ducey has maintained his nearly 2 to 1 lead, gaining 3 points. David Garcia has gained 2 points. Methodology: This 42% cell phone and 58% landline poll was completed by OH Predictive Insights on October 22, 2018 and October 23, 2018, from a likely 2018 General Election voter sample. The sample demographics accurately reflected party affiliation, gender, region, and age. The sample size was 600 completed surveys, with a MoE of ± 4%. Numbers may not total 100%, due to rounding. Poll report for the General Election poll can be viewed here. Phoenix-based OH Predictive Insights provides accurate polling, focus groups, data analytics and advanced targeted marketing to political and non-political clients alike. With leading professionals in the advertising, communication, polling and political arenas, OH Predictive Insights will service political and non-political clients looking to improve their footing on key stakeholders and consumers. On his first day at the Arizona Supreme Court, Justice Clint Bolick posted a sign in his office. It had two simple rules he expected staff to follow. Rule One: Call me Clint; Rule Two: There are no other rules. Although the first rule was never followed, I can think of no better example of the humility with which Justice Bolick has approached his job as the 44th justice of the Arizona Supreme Court—always taking his work, but never himself, seriously. I had the honor and privilege of serving as Justice Bolick’s law clerk for almost two years. From the moment he took the bench, he demonstrated a passion to execute his civic duty and fiercely protect both the federal and state constitutions. He did this every day with a smile, a venti Starbucks hot chocolate, and respect for his colleagues and attorneys who argued before him. Of the attorneys who argued before him, those surveyed gave him a 100 percent score on legal ability, integrity, and administrative performance. The high marks extended to those that worked behind the scenes, as well. Court staff joked he needed a Supreme Court greeter vest because he always stopped to say hello to everyone. In November, voters will be faced with a survey of their own. On the back of the ballot Arizonans will determine whether to retain Justice Bolick on the high court. This vote is based upon whether he has the judicial temperament, ability, and skill to remain on the bench. I know Justice Bolick exhibits these characteristics because I saw it every day without waiver. Since his time on the court, Justice Bolick has written 32 opinions. Of the 15 times he wrote for the majority, 14 of them were unanimous opinions. This amounts to hundreds, if not thousands, of pages where Justice Bolick outlines exactly how he came to his decision. Importantly, in not one of those decisions will you find “the party’s identity” a deciding factor. And there is no reason you would. Justice Bolick is the only Independent to ever serve on the Arizona Supreme Court. Indeed, independence is the cornerstone of his jurisprudence. The only common denominator throughout his writings is the plain language of the law. What it says is what it means. If you don’t like what it says, look to the Legislature. Some say true bravery comes in dissent. Justice Bolick has never shied from writing in opposition. In fact, he began his first dissent praising our freedom-loving state, while noting the very words on the Supreme Court building, “Where law ends, tyranny begins,” informing readers of a “draconian” Arizona law affecting a homeless man. Beyond judicial temperament, ability, and skill, Justice Bolick also has an unparalleled dedication to our great state. I remember two times where Justice Bolick was overcome with excitement. The first was when the Pokémon Go craze was at its height and some of the clerks found a Pokémon on his desk. The second was when he found out he would once again be teaching, this time Constitutional Law at ASU. Teaching, in any form, has always been a source of pride for Justice Bolick. It is why he insists on hiring an intern to work alongside his clerks every semester in chambers. There are countless mentees, just like me, who are forever grateful to learn from him. Before November, I hope you read his opinions (azjustice44.com) and watch the oral arguments (azcourts.gov). There you will see a justice whose impartiality and independence allows him to look beyond party and political favor to address each case anew. When you reach the back of your ballot consider what Arizona needs in the black robe. Then, grab a hot chocolate and join me in voting to retain Justice Bolick. 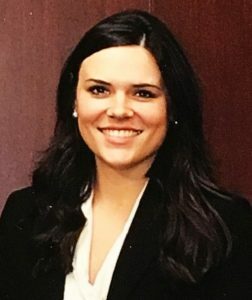 Ashley Torkelson is currently an attorney serving in the United States Air Force. The views expressed are those of Ms. Torkelson only and not those of the United States Air Force or Department of Defense. The Citizens Clean Elections Commission claims they care about keeping special interests out of the political process by providing candidates with taxpayer funds to run for office. But as was discovered in 2016 election cycle, politicians and political operatives know how to cheat the system and the unaccountable Clean Elections Commission just doesn’t seem to care. An examination of campaign finance reports filed by publicly funded Clean Election Candidates in 2018 show over $100,000 being funneled to the state, county and local political parties, as well as to other political operations such as the Arizona Democratic Legislative Campaign Committee (ADLCC). As was the case in prior elections, the democratic candidates running in the least competitive legislative districts are the biggest contributors to these electioneering efforts. One of the worst offenders is candidate Lynsey Robinson from conservative legislative district 12 in the East Valley. She gave a staggering $22,590 to the Democratic Party Operations, which is over 50 percent of the total amount she receives from Clean Elections! If her intention was to win her race, sending over half her money to the Party seems like a poor strategy to do so. Interestingly enough, the largest benefactor of these public funds was the ADLCC, a Political Action Committee chaired by legislative democrats to elect democrats around the state of Arizona. Traditionally, victory PACs such as this provide money and support tocandidates—they don’t receive money from them. This is because committees such as this fundraise for the express purpose of playing in election races. However, they do so independently of any candidate because it is against the law for organizations and PACs to coordinate with candidates on their election activities. That makes the expenditure to the ADLCC even more suspicious. Either a candidate is giving them money to use in other more competitive races (which is wrong and must be stopped), or they are giving them money to provide services to their campaign (which is likely illegal.) Either way, the ADLCC’s taxpayer gravy train is an offensive abuse of the system and should be stopped immediately. The unaccountable Clean Elections Commission has made it clear that they don’t care how our money is wasted, which is why voters must vote YES on Proposition 306. Prop 306 would prohibit candidates from funneling taxpayer funds to political parties and political special interest groups. If there was any question that the exploitation of the system would continue and proliferate – this year’s election season proves otherwise. Voters should put an end to it by Voting Yes on Prop 306. Not even Pepper Spray? That’s right! Sean Bowie voted to deny campus women their right to carry pepper spray or even a taser to defend themselves against sexual predators. What kind of person does that? As a deputized law enforcement officer and a parent of a daughter in college this is both professional and personal for me. Students, teachers and all employees of our universities in Arizona should feel safe, and not made to feel like they are breaking the law by protecting themselves with something as simple as pepper spray. With thousands of sexual assaults and even worse dozens of rapes reported to Police over the last few years, Sean Bowie and his extreme ideology left women defenseless when he voted against House Bill 2172 three times. 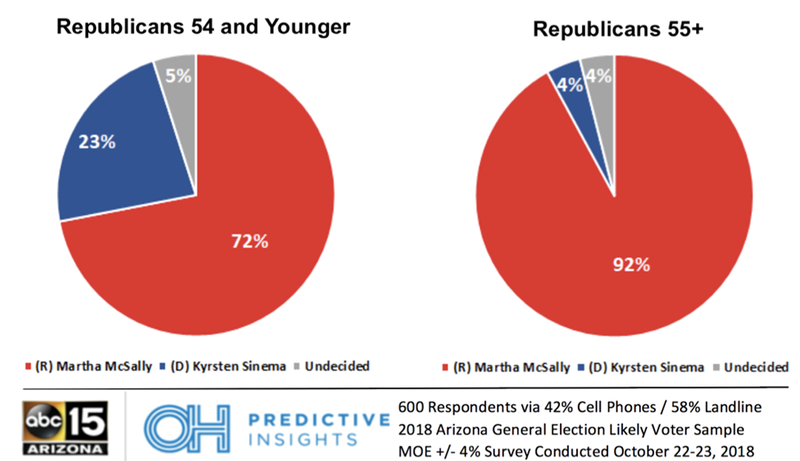 PHOENIX (Nov. 1, 2018) – The latest poll from OH Predictive Insights and ABC15 Arizona (ABC15/OHPI), conducted October 22 to 23, shows that Martha McSally, Arizona’s Republican nominee for U.S. Senate, has kept her lead over Democratic nominee Kyrsten Sinema, as undecideds break between the candidates. 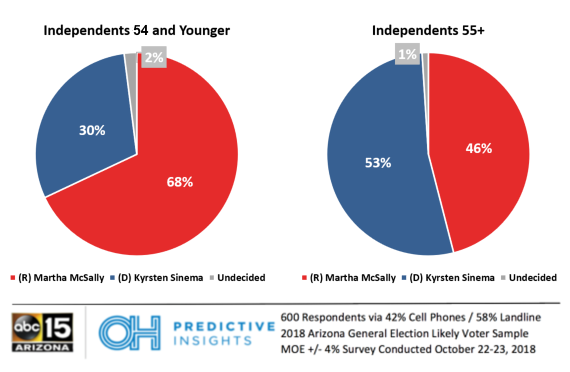 Among Independents over 55 years old, Sinema leads by seven points, with 53% compared to McSally’s 46%. Younger Independents are breaking more for McSally, giving her a 38-point lead of 68%, compared to Sinema’s 30%. “Considering the historic amount of money spent on this contest, which has been primarily in Pima and Maricopa County, it is ironic that rural Arizonans have tipped the scale in McSally’s direction,” says Data Analyst Noah Rudnick. 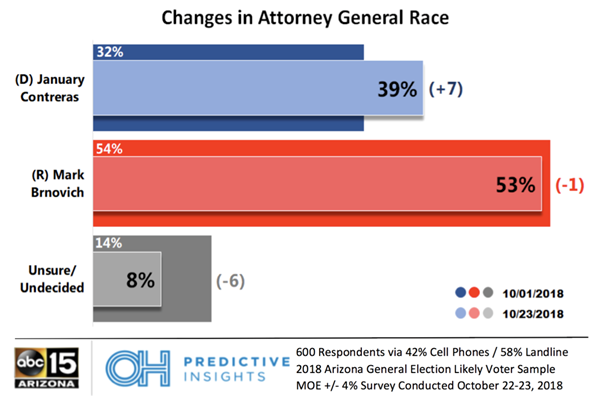 Methodology: This 42% cell phone and 58% landline poll was completed by OH Predictive Insights on October 22, 2018 and October 23, 2018, from a likely 2018 General Election voter sample. The sample demographics accurately reflected party affiliation, gender, region, and age. The sample size was 600 completed surveys, with a MoE of ± 4%. Numbers may not total 100%, due to rounding. The partisan advantage was set at +11% GOP, based on returns when finalizing last week. Poll report for the General Election poll can be viewed here. Last month the U.S Food and Drug Administration launched a crackdown on the sale of e-cigarette vaping devices and is ratcheting up pressure on e-cigarette makers. The industry is now facing new challenges as the federal, state, and local governments take new measures to put it under control. According to the CDC, smoking causes more than 500,000 deaths annually and leads to a plethora of preventable diseases. Since e-cigarettes provide users the ability to control their nicotine consumption, it helps traditional cigarette smokers to gradually kick their nicotine addiction. E-liquids come in varying levels of nicotine, including zero. This can be particularly helpful for long-time smokers who wish to use vapor products to reduce their dependence and transition away from nicotine entirely. These products are specifically designed for adult smokers who wish to live a healthier lifestyle by quitting cigarettes. Vapor products do not burn tobacco and do not produce smoke, tar, or ash. They only emit vapor. As most e-liquids contain nicotine, they are considered ‘tobacco products’ and regulated as such but these products do not contain any tobacco. E-liquids are only regulated by the FDA because they contain nicotine, which is itself derived from the tobacco plant. These regulations include company registration, product registration, detailed ingredient listings, labeling restrictions, marketing restrictions, and listings of harmful and potentially harmful constituents. Federal bureaucrats and critics of e-cigarettes are using the myth of a youth vaping “epidemic” to suggest that flavors need to be banned. The truth is, the vaping industry is already working to make sure there are penalties in place for selling vapor products to minors – just like there are for cigarettes, alcohol, and lottery tickets. As Americans, it is imperative we have the freedom to choose what is best for us and our family. Too often Washington, DC tells us what we can and can’t do. When Congresswoman McSally is elected to the U.S. Senate, she should continue to fight for Arizonans’ personal freedoms, especially for the thousands of adults across our state who need this innovative new technology to live a healthier lifestyle by quitting smoking. 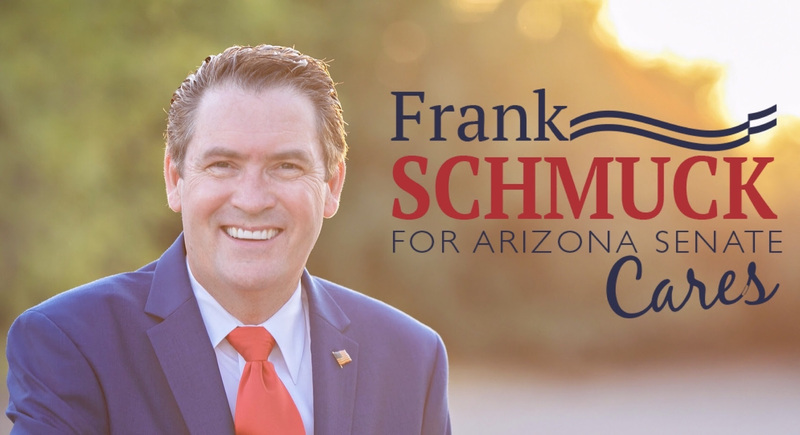 ABC 15 reviews Arizona Superintendent of Public Instruction candidates, Kathy Hoffman (D) and Frank Riggs (R). Martha McSally welcomes Iowa Senator Joni Ernst to Arizona GOP campaign event to talk global security. Martha McSally welcomes South Carolina Senator Lindsey Graham at Arizona GOP event. Jan Brewer favored by 9 points. 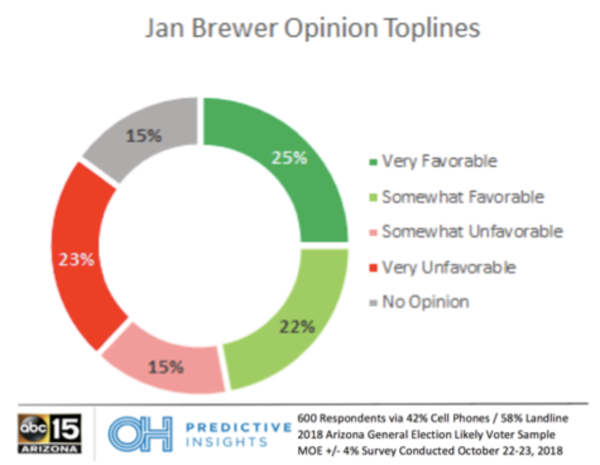 Of likely Arizona voters, 47% favor Brewer, while 38% find her unfavorable. Arizona’s former governor also has 85% name identification. Grant Woods not well-known by Arizonans. 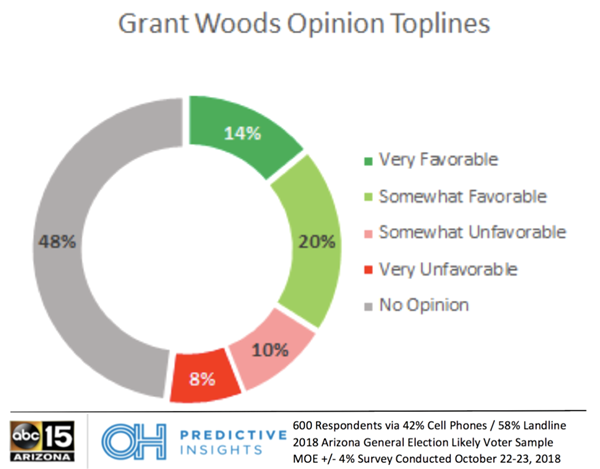 Woods is still not well-known, with almost half of people saying they have no opinion of him, at 48%. Of those who have an opinion, he is above water almost two to one. 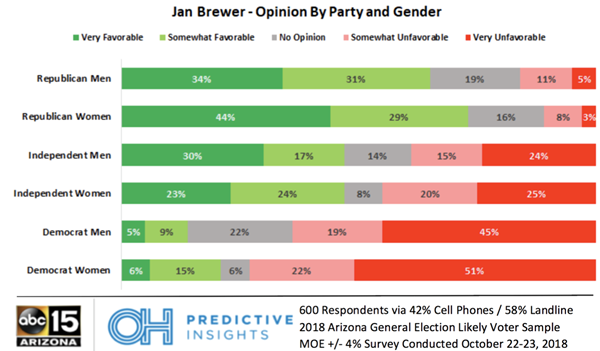 Brewer is favored most among Republican women. Among Republican women, Brewer is favored by +62 points. This is much higher than Republican men, at +49 points, providing a possible edge in a Republican primary. 28-point​ split among Democrats on Woods’ name recognition. Among Democrats’ likely base, voters 54 years old or younger have a 27% favorable rating of Woods. Older Democrats have a 55% positive opinion, which is a 28-point gap. 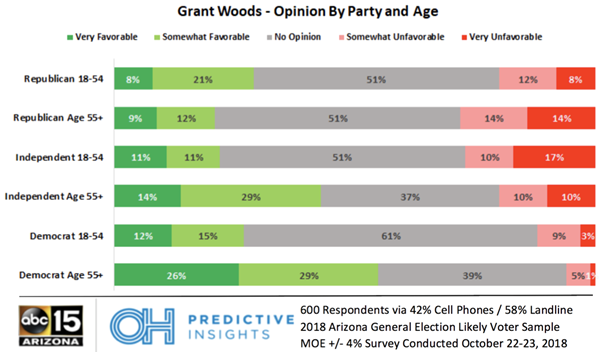 Woods also performs well with older Independents, at 43%. 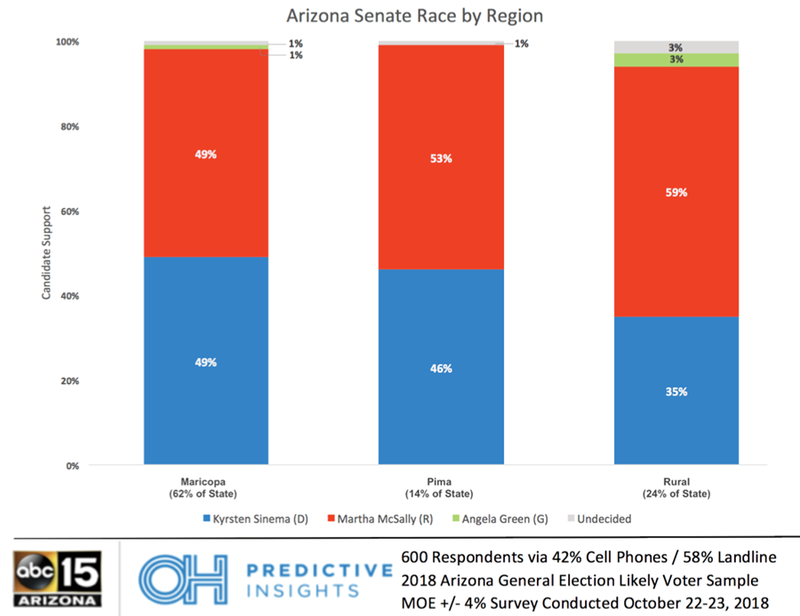 PHOENIX (October 29, 2018) – With only a few days left until the recommended deadline to mail in ballots, the top two candidates in the race for the United States Senate are locked in a dead heat with only one point separating them. The latest survey from HighGround Public Affairs shows Congresswoman Martha McSally with a slight lead over Congresswoman Kyrsten Sinema. Q. If the election for United States Senate were held today, would you vote for [Rotate] Republican Martha McSally, Democrat Kyrsten Sinema, Green Candidate Angela Green? The N=400 survey was conducted among likely voters 10/26 through 10/28. It was a statewide live caller survey calling both landlines and cell phones. The margin of error is ±4.9%. The partisan advantage was set at +10% GOP based on the current trend in ballot returns. As of today, GOP advantage in Early Ballot returns is 10.6% with 986k ballots returned according to Garrett Archer from the Arizona Secretary of State’s office. McSally held a strong lead among Republican respondents with 88.4% of the vote. She also held strong leads among very conservatives (94.0%), somewhat conservative (65.6%) and voters 65+ (57.0%) who are overperforming in the current ballot returns. For the moment, immigration has surpassed education as the top issue facing the state which has likely bolstered McSally’s performance based on her strongly articulated positions on border security. On the other hand, Sinema held strong leads among Democrats with 88.6% of the vote and very liberal (94.7%) and somewhat liberal (85.3%). She also has a strong lead with younger voters 29 and under (55.0%) – though their turnout so far has been lower than expected. The race now appears hinged on who can make a final successful push among Females and Independent and unaffiliated voters. The two candidates have split support among the two audiences. Sinema has a 6-point lead among all female voters right now. McSally and Sinema are virtually split among Independent and unaffiliated males (43.6% to 40.0% respectively). However, McSally trails Sinema significantly among independent and unaffiliated females (12.2% to 61.0% respectively). On the other hand, bolstered by an upward trend in the direction of the state and a faltering campaign by his opponent, Governor Ducey appears to be cruising to victory with a 19-point lead over Democratic Challenger David Garcia. Q. If the election for Arizona Governor were held today, would you vote for [Rotate] Republican Doug Ducey, Democrat David Garcia, or Green Candidate Angel Torres? Ducey holds commanding leads among Republican voters 89.5% as well as garnering an 11.5% lead among Independent and unaffiliated voters. His backing of Proposition 123 and his 20% teacher raise appeared to help him maintain credibility and deflect his opponent’s attacks on education. Ducey holds leads among male voters (57.3% to 31.3%) as well as female voters (52.4% to 38.9%) Garcia holds significant leads in Democrats with 75.0%, but still nearly 14 points lower than Sinema. He also has garnered support from the Very Liberal (89.5%) and the Somewhat Liberal (73.5%) but has failed to gain as much the crossover appeal he experienced in his previous race for Superintendent of Public Instruction. The poll surveyed 400 likely Arizona 2018 General Election voters who have a history of electoral participation and was balanced to model the likely turnout of voters across party, age, region, and gender. The live interview survey of voters was conducted by HighGround Public Affairs to both landline and cell phone users. The partisan advantage was set at +10% GOP based on the current trend in ballot returns. The margin of error is ±4.9%. The HighGround team has built a reputation of reliable and accurate polling over the past ten years – our research has been featured on Nate Silver’s 538, Real Clear Politics, Huffington Post, and many other publications. HighGround “nailed” the Prop 123 election results within 0.2% of the outcome prior to the May 2016 Special election. Visit our website to learn more about HighGround’s polling experience. View this article on HighGround.